Gaeta Olives DOP - Ficacci Co. This is the black pearl of Italian olives. 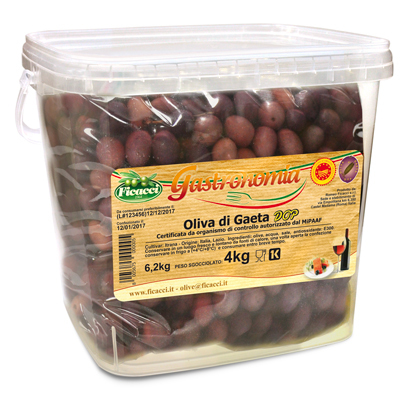 Gaeta is the most suitable olive for cooking. The most famous and most appreciated by Italian consumers. They can also be called: Itrana, Aitanella, Cicerone, Gaetana, Gitana, Olivacore, Reitana e Velletrana. This olive is the world antagonist of Kalamata olives, no gourmet connoisseur could tell which one is the best. From Wikipedia... Marketed for years under the name "Gaeta Olives" because Gaeta was a land of olive trees before that, for commercial reasons, olive cultivation leave the business to other more profitable activities. Today most of the production comes from Itri, slight hill country, about 5 km from the sea, and many other municipalities that are on the backbone of Lepini Mountains. Being self-sterile, it usues Leccino and Pendolino as pollinators. The produced fruit is suitable for the production of oil and for consumption on the table. An entirely new TAKE AWAY line 220/270g. 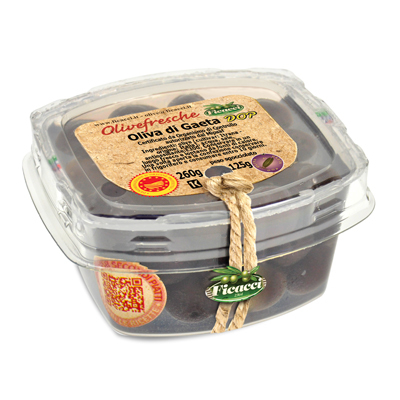 A new packaging and a line that offers more than 30 varieties of FRESH OLIVES: aged, traditional, garnished, special, inside a convenient heath-sealed pail with a protective atmoshere and an open close lid. Most of the references can be stored at room temperature. The new packaging, as well as ensuring a great visibility to the product on the shelfes, provides customers with several cooking suggestions and other useful information through the QR code. Thanks to an attractive take away 170 gr. tub, customers can now carry home the entire selection of olives available by the food counter. The tub is pre-packed and heat-sealed in modified atmosphere, without brine and with a shelf life of 2 months (refrigerated storage). The strong point of this new product is the broad range: 18 types, each distinct from one another, revealing Ficacci skills and vast tradition in the Olive market. The second improvement is Quality: exclusively the biggest and most daunting olives get selected combining them as only Ficacci can, pleasing even the most demanding “Gourmet” palate. Olive Fresche Take Away – 250 gr tubs (8.8 oz.) is a range that offers the complete range of Ficacci’s olive production, conceived in order to give the chance of tasting our entire selection in single serving portions. The selection includes olives in brine (salt and water, without the use of chemical additives) or in a delicate dressing of olive oil. As the name suggests, Take Away, is a line created to satisfy the bias of the most demanding consumer with a small and easy-to-carry package. The“Belle e Buone”selection bags of 400 gr (14 oz), are olives packed in a clear bag that assures the freshness of the product at a real deal price. This range enjoys from 10 years an enormous success on the Italian market, including well over 15 different selections of olives in brine or in a delicate olive oil dressing. This line has been created and selected specifically for the bar use, as appetizers, “tapas”, or for the use in “martini” and other drinks. The product is sealed and protected in each bucket by a transparent plastic bag, guaranteeing freshness and quality that can be easley seen.Once the bag is opened, the bucket continues to serve as a protective container and can be used and resealed each time.As a quick reference ficacci includes recipes for new and fun drinks and cocktail. This selection of olives is chosen and packed specifically for professional use in restaurants or/and deli counter.The bag-in-bucket assures the product freshness and makes it easy to use and store once opened, allowing a long shelf life.